Pigments, pastels, chalks, powders, mica, dyes, nail powders and more. What are they? What’s the difference between them? And more importantly, how do you use them with polymer clay? This 90-page guide (with 143 photos) answers all your questions about these intriguing powders and gives you the knowledge and confidence to springboard your creative explorations. This is not a tutorial and there are no step-by-step projects. Instead, you will fully understand these powdered materials and how they are part of the art materials we all use in our process of creating with polymer clay. This eBook will be the catalyst for you to explore these powders as surface treatments, as embellishments, and with your other media as well. This eBook is perfectly suited for all levels of polymer clay enthusiasts, from motivated beginners to experts. It’s an interesting read and everyone will learn new things! You’ll receive a professionally formatted and interactive PDF file that can be viewed on any device. The file is available for instant download and you’ll also be able to access the file indefinitely from your user account dashboard. You don’t need to know much about polymer clay to enjoy this eBook, but if you’re new to polymer, you might want to also purchase the Polymer Clay Essentials eBook to round out your education. As with all my tutorials, guides, and eBooks, this document features a Table of Contents, navigation links, and a resources section to help you find the materials featured. Text and images of the Powders Guide are Copyright © 2018 by Ginger Davis Allman, of The Blue Bottle Tree, all rights reserved. That means you can’t share this tutorial, teach or give it to friends, post the file or contents online, or sell it, etc. However, your creations are always yours to sell, share, and enjoy as you desire. I always appreciate credit and a shout-out whenever possible. Thank you! This past week I was on a quest to reproduce blue pearl Clay, it is a vital component In my color palette of Mica/pearl clays used in my work and upcoming workshop at Polymer Week in October in the Czech Republic. I leaned on Ginger Davis Allman for ideas for what type of pigments, powders, dyes ,inks and other colorants I may not even know about to achieve my goal. Luckily for me, and for all of us Ginger does her homework and we all benefit. The information she provided me with was just a fraction of the astounding amount of information included in her new 90+ page E-book. Ginger demystifies and educates us on the products we use along with our polymer clay medium for inclusions, sparkle, sheen, shimmer and all other special effects. You will also find the information contained in her E-book useful for many other mediums of art you may work with. The sharing of Gingers wealth of knowledge and I’m sure of endless hours of research she has put into a “Rocket Science Made Easy” understandable format. I hope you will all support her new book. It is definitely one of those things you need and didn’t realize you needed until you got it. I wasn’t sure what I would gain from purchasing this tutorial since I have already worked with powders on polymer clay. 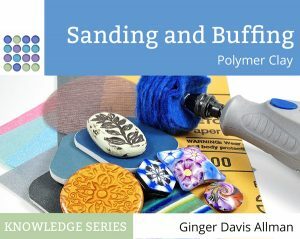 However it is hard to resist gaining more knowledge and supporting such a researcher and sharer as Ginger Davis Allman is to the polymer clay community. Was I surprised to not only continue my learning of pigments , dyes, etc but I also picked up a few techniques using powders that I have never tried or even thought about. If you have an interested in learning more about colorants, etc working with polymer clay this is a great tutorial to add to one’s collection. I like that it will take me time to review and go over as the days go by. It’s not a quick read by any means to totally digest and store to memory. It can be a quick read to pick up a few tips though. Oh my, Ginger!! The information packed into this Powders e-book has my imagination going a mile a minute. As we all have come to rely on you for, it is full of helpful facts backed up by your thorough research. It’s presented in an easy to follow format, with plenty of pictures. Powders will be a resource you reach for time and again! I’ve read through it once. Now it’s time to revisit the sections I want to tackle first! I had an opportunity to get some of Donna Harryman’s metal powders. Her selection is unlike any I’ve seen! I can’t wait to experiment with these lovely colors. With this and so many other new ideas sparked by this e-book, when will I have time to try them all? I know! I just need more hours in the day! Ginger, thanks once again for all the time and energy you devote to keeping us all well informed! Well done, my friend! The Powders tutorial is packed with wonderful information on all types of powders. Additionally, Ginger supplies many great tips for some of the powders. Excellent presentation. All her in-depth information has been well researched. Ginger never disappoints with her tutorials, they are worth every penny spent! Do you really know all you need to about the differences between mica powders and metal powders, or pigment powders and dye powders? Each of powdered colorants has different attributes that interact and behave differently with polymer clay. And some products we use with polymer clay are a combination of these materials, (e.g., Jacquard Pearl Ex Powdered Pigments contain both powdered pigments and powdered mica), so we need to understand the collective attributes of mixed-material powders in connection with PC. Ginger tells us about, and how to use, the most common powdered colorants with polymer clay successfully. She explains the color shifting effects of duochrome and multichrome colors. There are loads of application tips to get various surface effects with different types of powders on raw and baked clay, as well as helpful information on mixing your own colors of mica clay so you aren’t limited by the colors available commercially. Ginger even covers the various types of nail powders that can create such fabulous effects on PC (especially black PC)! She also addresses binder, sealers, safety considerations and much, much more. All of Ginger’s ebooks are well worth the price, and this one is positively crammed to the gills with valuable and reliable information! Good and solid information about powders. Professionally made. As other reviewers have said, this e book will save you a lot of heartache. I’m very new to claying so I thought pigments, mica & powders all worked the same way. I was so grateful to learn the different ways they work and adhere to the clay, as I would have made some big mistakes after working so hard. I really liked the recommendations of quality products on the market as it can be very confusing.This has given me a lot more confidence and I will keep is as a reference to help me as I learn more. Thanks Ginger, your writing is so relatable & comforting giving the average person confidence to get in a have a go. As with everything Ginger does, this e-book was well-researched and thorough. I bought the book right after I had ordered several jars of pigment powder. I was relieved to find that the information she provided confirmed that what I ordered would do what I’d hoped it would do. I now understand how the various types of powders work and why they work that way. I appreciate saving time and money not having to test all of these things myself. I can go straight to designing and making! Thank you again Ginger for another excellent and informative tutorial! This is an excellent resource on the types of powders available for use with polymer clay, the effects you can achieve, the need for sealer, safety issues and how to use the various products and much much more. This is well worth the 20 dollars to find out what works and how!